Researchers used 120 pristine honeybee colonies that were placed near 30 apple orchards around New York state. 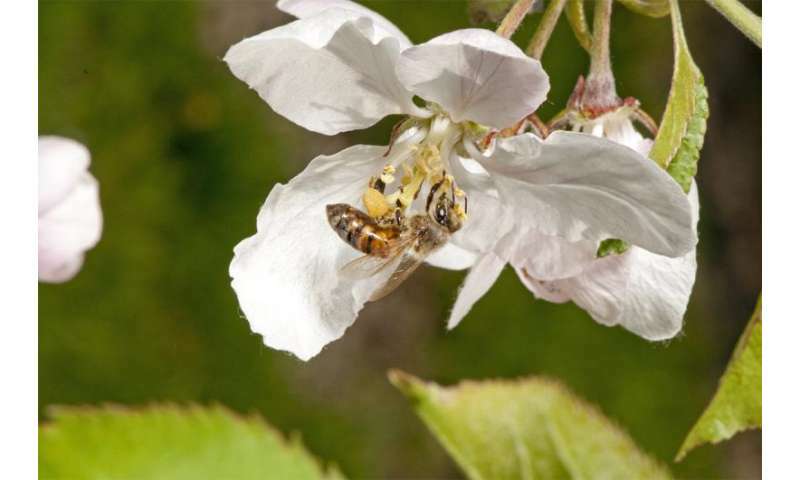 After allowing the bees to forage for several days during the apple flowering period, the scientists examined each hive's "beebread" – the bees' food stores made from gathered pollen – to search for traces of pesticides. In 17 percent of colonies, the beebread revealed the presence of acutely high levels of pesticide exposure, while 73 percent were found to have chronic exposure. The new Cornell study was published April 19 in Nature Scientific Reports. "Our data suggest pesticides are migrating through space and time," said lead author Scott McArt, assistant professor of entomology, who explained that bees may be gathering pollen from nontarget wildflowers, field margins and weeds like dandelions where insecticides seem to linger. "Surprisingly, there is not much known about the magnitude of risk or mechanisms of pesticide exposure when honeybees are brought in to pollinate major agricultural crops," he said. "Beekeepers are very concerned about pesticides, but there's very little field data. We're trying to fill that gap in knowledge, so there's less mystery and more fact regarding this controversial topic." More than 60 percent of the found pesticides were attributed to orchards and surrounding farmland that were not sprayed during the apple bloom season, according to the study. McArt said that persistent insecticides aimed at other crops may be surrounding the orchards. In addition, pre-bloom sprays in orchards may accumulate in nearby flowering weeds. "We found risk was attributed to many different types of pesticides. Neonicotinoids were not the whole story, but they were part of the story." he said. "Because neonicotinoids are persistent in the environment and accumulate in pollen and nectar, they are of concern. But one of our major findings is that many other pesticides contribute to risk." Mass-blooming crops flower in big bursts during the pollination season, so crop producers rent armies of honeybees to supplement the work of wild bees. "There are so many flowers at one given time, often there may not be enough wild bees to perform sufficient pollination services," said McArt. Crop pollination by insects, particularly bees, can be valued at more than $15 billion annually to the U.S. economy, according to research by Nicholas Calderone, professor emeritus of entomology. Producers and beekeepers are now concerned about the high rates of hive declines – estimated to be about 42 percent in 2014-15 domestically. In New York, the losses are often over 50 percent. To understand the economics, beekeepers may charge more than $100 per colony for pollination services for apple producers in New York, almond producers in California and blueberry growers in North Carolina. For large farms, several hundred to a thousand pollinating colonies are brought in via large trucks. Commercial beekeepers sometimes assume they will lose entire colonies, which is why pollination service rates have tripled or quadrupled over the past 15 years, McArt said. 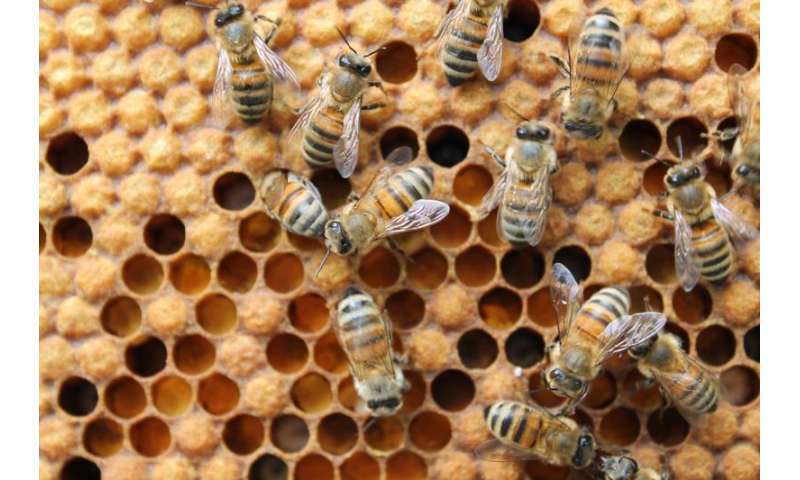 He recently shared his research with growers at a New York State Integrated Pest Management meeting, and several farmers said they are interested in altering crop management practices to reduce honeybee injury. The New York State Department of Environmental Conservation and the Department of Agriculture and Markets assembled a Pollinator Protection Plan in 2016. Scientists are developing best management practices, reviving pollinator populations, researching and monitoring, and developing outreach and educational programs for beekeepers and producers. Co-authors on the study, "High Pesticide Risk to Honeybees Despite Low Focal Crop Pollen Collection During Pollination of a Mass Blooming Crop," are lab manager Ashley Fersch; graduate student Nelson Milano; Lauren Truitt '17; and former research associate Katalin Böröczky.